Throughout the Middle Ages, small keepsakes were made for the masses of pilgrims who visited shrines across Europe, the Byzantine Empire and the Holy Land. 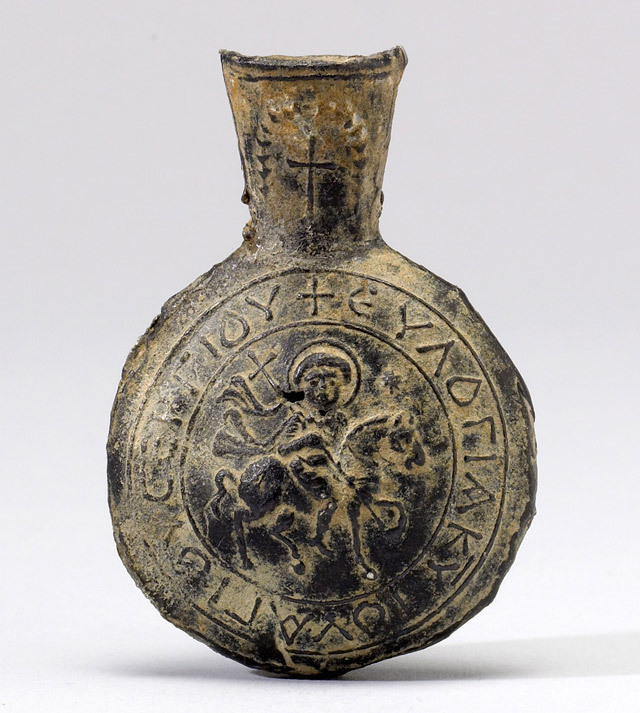 A pilgrim flask, or ampulla, was a popular type of this sort of souvenir. These small vials were made to contain holy water or holy oil from a saint's shrine. These were usually made of relatively cheap materials and were cast in reusable molds. This example is typical in shape, having a circular body made of two domical halves, somewhat flattened in the center, with a narrow neck that could be crimped shut, or sealed with a stopper. Such flasks were sometimes carried home to heal a family member who was too ill to make the journey to the shrine, and in some cases they were given to a local church by a returning pilgrim. 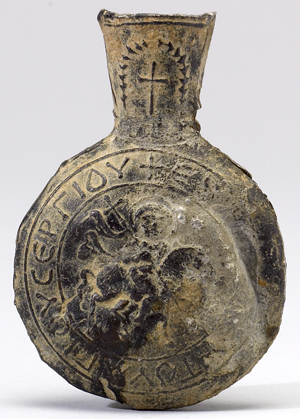 Pilgrim flasks could be worn around the neck as a pendant, or suspended in the home or over an altar. Examples have been found from shrines across eastern and western Europe and the Holy Land, and they are mentioned in a number of textual accounts of pilgrimage from the early Christian and medieval periods. This well-preserved example depicts, on both sides, St. Sergios on horseback, encircled by an inscription. St. Sergios, often paired with St. Bakchos, was reputed to be an officer in the Roman army who was martyred in the third century when he was exposed as a Christian. His cult center was located in Sergiopolis (Resafa), in northern Syria, a city near the supposed site of his martyrdom.